All users are allowed to edit this page. This sandbox is currently in use to make notes about the Lore namespace (standardization of formats/content, mostly). The province pages are in need of a major overhaul. Though they are "getting there", they need to have detailed info, like this Featured Article does. Once Skyrim is released, I'm going to want to make lengthy notes on the climate, economy, culture, etc. of the land, so as to further expand the associated Lore article. All articles in the Lore namespace need to follow the format of: "Content, Notes, References, Additional Reference Types, See Also, Addition Sections"
Images can go on either side of a page, as long as it looks good. References. WE! NEED! MORE! REFERENCES! College of Whispers -- This page is going to need to be revamped when Skyrim's released as it will be featured in the game. As first mentioned by rpeh on his user page, the editors in the lore namespace has thus far gone out of their way to make sure that nearly every single person named in every lore-relevant in-game book, document, or note has their own entry on the People pages. Personally, I'm probably only about 10% convinced that this is necessary, my reasoning being that we're just creating sections and articles for the sake of having sections and articles. So I decided to go ahead and list those remaining (without an article or section) here, so that the community can decide later on based on this list whether or not every named person should have an article or section dedicated to them. Hana -- Maid in the service of Count Sven Advensen. Lady Inga Advensen -- Wife of Count Sven Advensen. Jonni -- Appears to be one of the five sons of Inga and Sven Advensen. Sotha Sil, or Seht, wizard-mystic god of the Dunmer, is the least known of the divine Tribunal. He is said to be reshaping the world from his hidden Clockwork City. Once the last survivor of a minor Dunmer House, Sotha Sil became a great wizard in life and later discovered how to use Kagrenac's Tools on the Heart of Lorkhan to steal its divine powers and become a god. After Nerevar's death, the councilors of Nerevar and the Tribunal of Vivec, Almalexia, and Sotha Sil came to power among the Dunmer. They then went against Nerevar's dying wish by using the profane Tools of Kagrenac on the Heart of Lorkhan in order to steal its divine essence for themselves. They achieved great heroism with their divinity, but it was also their undoing; because they worked deeds of good against the evil of the Heart they were weakened even before the return of Dagoth Ur. Dagoth Ur, who had also stolen power from the Heart, acted in accordance with its evil and grew stronger. During the end of First Era, around 1E 2920, Sotha Sil spent some time on the Isle of Artaeum, where he taught some of the new mages of the Psijic Order. After a Daedric disaster in the village of Gilverdale, Sotha Sil journeyed into Oblivion via the Dreaming Cavern and made a pact with eight of the more prominent Daedric Princes: Azura, Boethiah, Hermaeus Mora, Hircine, Malacath, Mehrunes Dagon, Molag Bal, and Sheogorath. The exact terms of the pact are unknown to most inhabitants of Tamriel. At the time of the pact, the Princes agreed not to answer any summoning by amateurs until the war between Morrowind and Cyrodiil ended; only the Psijics, along with sorcerers and witches, could counsel with the Daedra. Sotha Sil's pact failed to prevent the destruction of Mournhold. A Bretony witch managed to summon Mehrunes Dagon and asked for Mournhold to be destroyed. Although Sotha Sil and Almalexia were too late to prevent the devastation, they managed to banish the Prince of Destruction back to Oblivion. In 2E 882, when the Tribunal visited the Red Mountain for a ritual to replenish their divine power, the reawakened Dagoth Ur and his minions ambushed them and drove them away, cutting off access to the Heart of Lorkhan. In 3E 417, after centuries of becoming weaker and more desperate, Sotha Sil and Almalexia lost two of Kagrenac's Tools, Keening and Sunder, to Dagoth Ur's forces. Vivec rescued them, but they could not recover the stolen Tools and had to flee Red Mountain. In time, Sotha Sil became almost completely detached from the real world. He gradually lost touch with the affairs of the Dunmer, the rest of the Tribunal, and eventually all of Tamriel. Losing Keening and Sunder was his last known participation in mortal affairs. He was killed in 3E 427 by his long-time friend and fellow Tribune, Almalexia, who had been driven mad by the decline of her power due to being deprived of the Heart of Lorkhan. 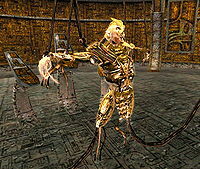 The only noticeable effect that Sotha Sil's Clockwork City had on the world was when Almalexia unleashed its mechanical inhabitants on Mournhold. This brutal but brief reign of terror was brought to an end by the Nerevarine. ^ a b Events of Tribunal. According to one theory, Wulfarth, Tiber Septim, and Zurin Arctus can all be regarded as parts of the same enantiomorphic Oversoul that makes up the deity known as Talos. Note: The Merethic Era is also considered, with the Dawn Era, to be part of the Mythic Era. Note: Few dates are known for events in the Merethic Era, but the order of events is known. Note: Dates and basic information provided by the Imperial Library. Supposed date of construction of the Adamantine Tower on Balfiera Island in High Rock, the oldest known structure of Tamriel. Earliest historical date in unpublished Elvish chronicles. Aboriginal beast races (who would later become the Khajiit, Argonian, and other beastfolk) live in communities throughout Tamriel. The Aldmer (Elves) leave the doomed and now-lost continent of Aldmeris (also known as 'Old Ehlnofey') and settle in Tamriel. The first colonies are built along the entire coast of Tamriel. Later, inland settlements were founded primarily in fertile lowlands in southwest and central Tamriel. The technologically advanced Aldmeri culture drove the primitive beastfolk into the wilds of Tamriel. The Adamantine Tower is rediscovered and captured by the Direnni, a prominent and powerful Aldmeri clan. Crystal Tower is built on Summerset Isle and, later, White Gold Tower in Cyrodiil. One of these Aldmeri Explorers, Torval the Pilot, explores and charts Tamriel sea-lanes and the River Niben, located in southern Tamriel. He sails deep into central Cyrodiil, and acquires the Eight Islands (the site of White Gold Tower) from the beastfolk natives for the secret of literacy. Later, during the Middle Merethic Era, Aldmeri explorers map the coasts of Vvardenfell, building the First Era High Elven wizard towers at Ald Redaynia, Bal Fell, Tel Aruhn, and Tel Mora in Morrowind. The Ayleids (Wild Elves) flourish in the jungles surrounding White Gold Tower (present day Cyrodiil). Wild Elves, also known as the Heartland High Elves, preserved the Dawn Era magicks and language of the Ehlnofey. Ostensibly a tribute-land to the High King of Alinor, Cyrodiil was often so isolated from the Summerset Isles as to be its own sovereign nation. The Dwemer (or Dwarves), a free-thinking, reclusive Elven clan devoted to the secrets of science, engineering, and alchemy, established underground cities and communities in the mountain range (later the Velothi Mountains) separating modern Skyrim and Resdayn/Morrowind. The Late Middle Merethic Era is also the period of the High Velothi Culture. The Chimer (ancestors of the modern Dunmer, or Dark Elves), dynamic, ambitious, long-lived Elven clans devoted to fundamentalist ancestor worship, followed the Prophet Veloth out of ancestral Elven homelands to settle in the lands now known as Morrowind. 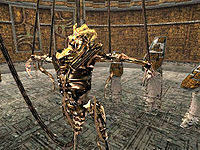 Despising the secular culture and profane practices of the Dwemer, the Chimer also coveted the lands and resources of the Dwemer, and for centuries provoked them with minor raids and territorial disputes. Trinimac (strongest of the Altmeri ancestor spirits) and his people (who became the Orsimer or the Pariah Folk) try to halt Velothi dissident movement. However, Daedric Prince Boethiah as one of the mastermind of the movement, eats Trinimac. Trinimac's body and spirit are corrupted, and he emerges as Daedric Prince Malacath. The rest of his people are changed as well. They are now known as Orcs. Velothi high culture disappears on Vvardenfell Island. The earliest Dwemer Freehold colonies date from this period. Degenerate Velothi devolves into tribal cultures, which, in time, evolves into the modern Great Houses of Morrowind, or persists as the barbarian Ashlander tribes. The only surviving traces of this tribal culture are scattered Velothi towers and Ashlander nomads on Vvardenfell Island. The original First Era High Elven wizard towers along the coasts of Tamriel are also abandoned about this time. The proto-Nords in the final migration from Atmora (also 'Altmora' or 'the Elder Wood' in Aldmeris) settle in northern Tamriel. Nordic hero Ysgramor, leader of a great colonizing fleet to Tamriel, develops a runic transcription of Nordic speech based on Elvish principles, and is the first human historian. Ysgramor's fleet lands at Hsaarik Head at the extreme northern tip of Skyrim's Broken Cape. The Nords build there the legendary city of Saarthal. The Elves drive the Men away during the Night of Tears, but Ysgramor soon returns with his Five Hundred Companions. An immortal hero, warrior, sorceror, and king variously known as Pelinal Whitestrake, Harrald Hairy Breeks, Ysmir, Wulfharth, Hans the Fox, etc., wanders Tamriel, gathering armies, conquering lands, ruling, then abandoning his kingdoms to wander again. Sul, an aged Dunmer man, woke in the Lank Fellow Inn in Chorrol after having dreamed of Iffech and Keem, two Khajiit who sailed with a human woman, Grayne. They had all three died as they witnessed a city appearing in the sky over the water. The innkeeper was standing at his open doorway, a sword drawn due to Sul's screams in his sleep. As he rinsed his face, he noticed two books Azura left for him on a shelf; Tales of Southern Waters to send him in the right direction, and The Most Current and High Adventures of Prince Attrebus to show him who to look for. Attrebus and Sul came upon a pack of Khajiit mounted on monstrous Khajiit as tall as large horses. They introduce themselves as the F’aashe clan. Attrebus and Sul struck a deal with the Khajiit, that they’d buy and bring back to them moon sugar in return for protection. They returned with the moon sugar to find a party of guards waiting for them at the Khajiit camp, whom Attrebus took care of by invoking his name and status with the still-loyally-Imperial captain. The Khajiit joined their party in thanks. When Attrebus and Sul discussed again Sul’s goal of reaching Vivec City before Umbriel, Attrebus convinced him to explain why. 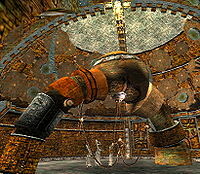 He explained that when Vivec was no longer available to hold the Ministry of Truth’s velocity in check, Vuhon created the ingenium to hold it in place, though it required souls to function. The ingenium exploded, however, and the Ministry of Truth crashed into Vivec City, causing Red Mountain to explode and hurling Vuhon into Oblivion. Sul was in the ministry when it happened, and was also thrown into Oblivion; Clavicus Vile’s realm, specifically. When he arrived, he and Vuhon met Umbra, a man who claimed to have once been held captive by Clavicus Vile inside a sword, and had been waiting for this moment to hurl the sword out of Oblivion to keep it out of Clavicus Vile’s hands. Umbra and Vuhon struck a deal; if Umbra would spare him, he’d build another ingenium, which Umbra could use to escape the Daedric Prince. During this time, Vuhon kept Sul in a torture chamber, where he eventually forgot about him and Sul escaped. Attrebus remarked that they still wouldn’t reach Vivec City in time, and Sul responded that they’d take a shortcut through Oblivion and then left him alone. Attrebus' screams brought him to where he left him, to find Umbriel upon them, moving toward them. They attempted to move back to their entry position, but were transported to Umbriel. They were suspended in a type of spiderweb-like net in front of Vuhon. As they spoke, Sul accused Vuhon of murdering his love, Ilzheven, and destroying Vvardenfell; Vuhon contested that it was actually Sul that did that. It was revealed that Ilzheven had a very special type of soul, and Vuhon was using her to power the ingenium, to hold the Ministry of Truth aloft over Vivec City. When Sul freed her, it sent the Ministry of Truth crashing into Vivec City, killing Ilzheven and throwing Sul and Vuhon into Oblivion. Vuhon also revealed that he has an ally inside the Imperial Palace, the person that was trying to have Attrebus killed. He said he'd need the Imperial City, specifically the White Gold Tower, and offers him the chance to convince his father to back down. Through his close relationship with Oblivion; Sul shatters Vuhon's glass world by summoning a massive daedra. However, he then grasps Prince Mede's shoulder and says "not now," before transporting them out of Umbriel.